Read the complete text of the World Heritage Convention. You can download or print the complete text in the language of your choice. Adopts this sixteenth day of November 1972 this Convention. sites: works of man or the combined works of nature and man, and areas including archaeological sites which are of outstanding universal value from the historical, aesthetic, ethnological or anthropological point of view. natural sites or precisely delineated natural areas of outstanding universal value from the point of view of science, conservation or natural beauty. It is for each State Party to this Convention to identify and delineate the different properties situated on its territory mentioned in Articles 1 and 2 above. Each State Party to this Convention recognizes that the duty of ensuring the identification, protection, conservation, presentation and transmission to future generations of the cultural and natural heritage referred to in Articles 1 and 2 and situated on its territory, belongs primarily to that State. It will do all it can to this end, to the utmost of its own resources and, where appropriate, with any international assistance and co-operation, in particular, financial, artistic, scientific and technical, which it may be able to obtain. to foster the establishment or development of national or regional centres for training in the protection, conservation and presentation of the cultural and natural heritage and to encourage scientific research in this field. Whilst fully respecting the sovereignty of the States on whose territory the cultural and natural heritage mentioned in Articles 1 and 2 is situated, and without prejudice to property right provided by national legislation, the States Parties to this Convention recognize that such heritage constitutes a world heritage for whose protection it is the duty of the international community as a whole to co-operate. The States Parties undertake, in accordance with the provisions of this Convention, to give their help in the identification, protection, conservation and presentation of the cultural and natural heritage referred to in paragraphs 2 and 4 of Article 11 if the States on whose territory it is situated so request. Each State Party to this Convention undertakes not to take any deliberate measures which might damage directly or indirectly the cultural and natural heritage referred to in Articles 1 and 2 situated on the territory of other States Parties to this Convention. For the purpose of this Convention, international protection of the world cultural and natural heritage shall be understood to mean the establishment of a system of international co-operation and assistance designed to support States Parties to the Convention in their efforts to conserve and identify that heritage. 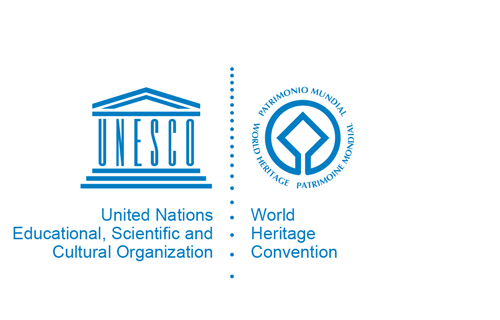 An Intergovernmental Committee for the Protection of the Cultural and Natural Heritage of Outstanding Universal Value, called "the World Heritage Committee", is hereby established within the United Nations Educational, Scientific and Cultural Organization. It shall be composed of 15 States Parties to the Convention, elected by States Parties to the Convention meeting in general assembly during the ordinary session of the General Conference of the United Nations Educational, Scientific and Cultural Organization. The number of States members of the Committee shall be increased to 21 as from the date of the ordinary session of the General Conference following the entry into force of this Convention for at least 40 States. Election of members of the Committee shall ensure an equitable representation of the different regions and cultures of the world. A representative of the International Centre for the Study of the Preservation and Restoration of Cultural Property (ICCROM), a representative of the International Council of Monuments and Sites (ICOMOS) and a representative of the International Union for Conservation of Nature and Natural Resources (IUCN), to whom may be added, at the request of States Parties to the Convention meeting in general assembly during the ordinary sessions of the General Conference of the United Nations Educational, Scientific and Cultural Organization, representatives of other intergovernmental or non-governmental organizations, with similar objectives, may attend the meetings of the Committee in an advisory capacity. The term of office of States members of the World Heritage Committee shall extend from the end of the ordinary session of the General Conference during which they are elected until the end of its third subsequent ordinary session. The term of office of one-third of the members designated at the time of the first election shall, however, cease at the end of the first ordinary session of the General Conference following that at which they were elected; and the term of office of a further third of the members designated at the same time shall cease at the end of the second ordinary session of the General Conference following that at which they were elected. The names of these members shall be chosen by lot by the President of the General Conference of the United Nations Educational, Scientific and Cultural Organization after the first election. States members of the Committee shall choose as their representatives persons qualified in the field of the cultural or natural heritage. The World Heritage Committee shall adopt its Rules of Procedure. The Committee may at any time invite public or private organizations or individuals to participate in its meetings for consultation on particular problems. The Committee may create such consultative bodies as it deems necessary for the performance of its functions. Every State Party to this Convention shall, in so far as possible, submit to the World Heritage Committee an inventory of property forming part of the cultural and natural heritage, situated in its territory and suitable for inclusion in the list provided for in paragraph 2 of this Article. This inventory, which shall not be considered exhaustive, shall include documentation about the location of the property in question and its significance. On the basis of the inventories submitted by States in accordance with paragraph 1, the Committee shall establish, keep up to date and publish, under the title of "World Heritage List," a list of properties forming part of the cultural heritage and natural heritage, as defined in Articles 1 and 2 of this Convention, which it considers as having outstanding universal value in terms of such criteria as it shall have established. An updated list shall be distributed at least every two years. The inclusion of a property in the World Heritage List requires the consent of the State concerned. The inclusion of a property situated in a territory, sovereignty or jurisdiction over which is claimed by more than one State shall in no way prejudice the rights of the parties to the dispute. The Committee shall establish, keep up to date and publish, whenever circumstances shall so require, under the title of "List of World Heritage in Danger", a list of the property appearing in the World Heritage List for the conservation of which major operations are necessary and for which assistance has been requested under this Convention. This list shall contain an estimate of the cost of such operations. The list may include only such property forming part of the cultural and natural heritage as is threatened by serious and specific dangers, such as the threat of disappearance caused by accelerated deterioration, large- scale public or private projects or rapid urban or tourist development projects; destruction caused by changes in the use or ownership of the land; major alterations due to unknown causes; abandonment for any reason whatsoever; the outbreak or the threat of an armed conflict; calamities and cataclysms; serious fires, earthquakes, landslides; volcanic eruptions; changes in water level, floods and tidal waves. The Committee may at any time, in case of urgent need, make a new entry in the List of World Heritage in Danger and publicize such entry immediately. The Committee shall define the criteria on the basis of which a property belonging to the cultural or natural heritage may be included in either of the lists mentioned in paragraphs 2 and 4 of this article. Before refusing a request for inclusion in one of the two lists mentioned in paragraphs 2 and 4 of this article, the Committee shall consult the State Party in whose territory the cultural or natural property in question is situated. The Committee shall, with the agreement of the States concerned, co-ordinate and encourage the studies and research needed for the drawing up of the lists referred to in paragraphs 2 and 4 of this article. The fact that a property belonging to the cultural or natural heritage has not been included in either of the two lists mentioned in paragraphs 2 and 4 of Article 11 shall in no way be construed to mean that it does not have an outstanding universal value for purposes other than those resulting from inclusion in these lists. The World Heritage Committee shall receive and study requests for international assistance formulated by States Parties to this Convention with respect to property forming part of the cultural or natural heritage, situated in their territories, and included or potentially suitable for inclusion in the lists mentioned referred to in paragraphs 2 and 4 of Article 11. The purpose of such requests may be to secure the protection, conservation, presentation or rehabilitation of such property. Requests for international assistance under paragraph 1 of this article may also be concerned with identification of cultural or natural property defined in Articles 1 and 2, when preliminary investigations have shown that further inquiries would be justified. The Committee shall decide on the action to be taken with regard to these requests, determine where appropriate, the nature and extent of its assistance, and authorize the conclusion, on its behalf, of the necessary arrangements with the government concerned. The Committee shall determine an order of priorities for its operations. It shall in so doing bear in mind the respective importance for the world cultural and natural heritage of the property requiring protection, the need to give international assistance to the property most representative of a natural environment or of the genius and the history of the peoples of the world, the urgency of the work to be done, the resources available to the States on whose territory the threatened property is situated and in particular the extent to which they are able to safeguard such property by their own means. The Committee shall draw up, keep up to date and publicize a list of property for which international assistance has been granted. The Committee shall decide on the use of the resources of the Fund established under Article 15 of this Convention. It shall seek ways of increasing these resources and shall take all useful steps to this end. The Committee shall co-operate with international and national governmental and non-governmental organizations having objectives similar to those of this Convention. For the implementation of its programmes and projects, the Committee may call on such organizations, particularly the International Centre for the Study of the Preservation and Restoration of cultural Property (the Rome Centre), the International Council of Monuments and Sites (ICOMOS) and the International Union for Conservation of Nature and Natural Resources (IUCN), as well as on public and private bodies and individuals. Decisions of the Committee shall be taken by a majority of two-thirds of its members present and voting. A majority of the members of the Committee shall constitute a quorum. The World Heritage Committee shall be assisted by a Secretariat appointed by the Director-General of the United Nations Educational, Scientific and Cultural Organization. The Director-General of the United Nations Educational, Scientific and Cultural Organization, utilizing to the fullest extent possible the services of the International Centre for the Study of the Preservation and the Restoration of Cultural Property (the Rome Centre), the International Council of Monuments and Sites (ICOMOS) and the International Union for Conservation of Nature and Natural Resources (IUCN) in their respective areas of competence and capability, shall prepare the Committee's documentation and the agenda of its meetings and shall have the responsibility for the implementation of its decisions. A Fund for the Protection of the World Cultural and Natural Heritage of Outstanding Universal Value, called "the World Heritage Fund", is hereby established. The Fund shall constitute a trust fund, in conformity with the provisions of the Financial Regulations of the United Nations Educational, Scientific and Cultural Organization. all other resources authorized by the Fund's regulations, as drawn up by the World Heritage Committee. Contributions to the Fund and other forms of assistance made available to the Committee may be used only for such purposes as the Committee shall define. The Committee may accept contributions to be used only for a certain programme or project, provided that the Committee shall have decided on the implementation of such programme or project. No political conditions may be attached to contributions made to the Fund. Without prejudice to any supplementary voluntarycontribution, the States Parties to this Convention undertake to pay regularly, every two years, to the World Heritage Fund, contributions, the amount of which, in the form of a uniform percentage applicable to all States, shall be determined by the General Assembly of States Parties to the Convention, meeting during the sessions of the General Conference of the United Nations Educational, Scientific and Cultural Organization. This decision of the General Assembly requires the majority of the States Parties present and voting, which have not made the declaration referred to in paragraph 2 of this Article. In no case shall the compulsory contribution of States Parties to the Convention exceed 1% of the contribution to the regular budget of the United Nations Educational, Scientific and Cultural Organization. However, each State referred to in Article 31 or in Article 32 of this Convention may declare, at the time of the deposit of its instrument of ratification, acceptance or accession, that it shall not be bound by the provisions of paragraph 1 of this Article. A State Party to the Convention which has made the declaration referred to in paragraph 2 of this Article may at any time withdraw the said declaration by notifying the Director-General of the United Nations Educational, Scientific and Cultural Organization. However, the withdrawal of the declaration shall not take effect in regard to the compulsory contribution due by the State until the date of the subsequent General Assembly of States parties to the Convention. In order that the Committee may be able to plan its operations effectively, the contributions of States Parties to this Convention which have made the declaration referred to in paragraph 2 of this Article, shall be paid on a regular basis, at least every two years, and should not be less than the contributions which they should have paid if they had been bound by the provisions of paragraph 1 of this Article. Any State Party to the Convention which is in arrears with the payment of its compulsory or voluntary contribution for the current year and the calendar year immediately preceding it shall not be eligible as a Member of the World Heritage Committee, although this provision shall not apply to the first election. The terms of office of any such State which is already a member of the Committee shall terminate at the time of the elections provided for in Article 8, paragraph 1 of this Convention. The States Parties to this Convention shall consider or encourage the establishment of national public and private foundations or associations whose purpose is to invite donations for the protection of the cultural and natural heritage as defined in Articles 1 and 2 of this Convention. The States Parties to this Convention shall give their assistance to international fund-raising campaigns organized for the World Heritage Fund under the auspices of the United Nations Educational, Scientific and Cultural Organization. They shall facilitate collections made by the bodies mentioned in paragraph 3 of Article 15 for this purpose. Any State Party to this Convention may request international assistance for property forming part of the cultural or natural heritage of outstanding universal value situated within its territory. It shall submit with its request such information and documentation provided for in Article 21 as it has in its possession and as will enable the Committee to come to a decision. Subject to the provisions of paragraph 2 of Article 13, sub-paragraph (c) of Article 22 and Article 23, international assistance provided for by this Convention may be granted only to property forming part of the cultural and natural heritage which the World Heritage Committee has decided, or may decide, to enter in one of the lists mentioned in paragraphs 2 and 4 of Article 11. The World Heritage Committee shall define the procedure by which requests to it for international assistance shall be considered and shall specify the content of the request, which should define the operation contemplated, the work that is necessary, the expected cost thereof, the degree of urgency and the reasons why the resources of the State requesting assistance do not allow it to meet all the expenses. Such requests must be supported by experts' reports whenever possible. Requests based upon disasters or natural calamities should, by reasons of the urgent work which they may involve, be given immediate, priority consideration by the Committee, which should have a reserve fund at its disposal against such contingencies. Before coming to a decision, the Committee shall carry out such studies and consultations as it deems necessary. the granting, in exceptional cases and for special reasons, of non-repayable subsidies. The World Heritage Committee may also provide international assistance to national or regional centres for the training of staff and specialists at all levels in the field of identification, protection, conservation, presentation and rehabilitation of the cultural and natural heritage. International assistance on a large scale shall be preceded by detailed scientific, economic and technical studies. These studies shall draw upon the most advanced techniques for the protection, conservation, presentation and rehabilitation of the natural and cultural heritage and shall be consistent with the objectives of this Convention. The studies shall also seek means of making rational use of the resources available in the State concerned. As a general rule, only part of the cost of work necessary shall be borne by the international community. The contribution of the State benefiting from international assistance shall constitute a substantial share of the resources devoted to each programme or project, unless its resources do not permit this. The World Heritage Committee and the recipient State shall define in the agreement they conclude the conditions in which a programme or project for which international assistance under the terms of this Convention is provided, shall be carried out. It shall be the responsibility of the State receiving such international assistance to continue to protect, conserve and present the property so safeguarded, in observance of the conditions laid down by the agreement. The States Parties to this Convention shall endeavor by all appropriate means, and in particular by educational and information programmes, to strengthen appreciation and respect by their peoples of the cultural and natural heritage defined in Articles 1 and 2 of the Convention. They shall undertake to keep the public broadly informed of the dangers threatening this heritage and of the activities carried on in pursuance of this Convention. States Parties to this Convention which receive international assistance under the Convention shall take appropriate measures to make known the importance of the property for which assistance has been received and the role played by such assistance. The States Parties to this Convention shall, in the reports which they submit to the General Conference of the United Nations Educational, Scientific and Cultural Organization on dates and in a manner to be determined by it, give information on the legislative and administrative provisions which they have adopted and other action which they have taken for the application of this Convention, together with details of the experience acquired in this field. These reports shall be brought to the attention of the World Heritage Committee. The Committee shall submit a report on its activities at each of the ordinary sessions of the General Conference of the United Nations Educational, Scientific and Cultural Organization. This Convention is drawn up in Arabic, English,French, Russian and Spanish, the five texts being equally authoritative. This Convention shall be subject to ratification or acceptance by States members of the United Nations Educational, Scientific and Cultural Organization in accordance with their respective constitutional procedures. The instruments of ratification or acceptance shall be deposited with the Director-General of the United Nations Educational, Scientific and Cultural Organization. This Convention shall be open to accession by all States not members of the United Nations Educational, Scientific and Cultural Organization which are invited by the General Conference of the Organization to accede to it. Accession shall be effected by the deposit of an instrument of accession with the Director-General of the United Nations Educational, Scientific and Cultural Organization. This Convention shall enter into force three months after the date of the deposit of the twentieth instrument of ratification, acceptance or accession, but only with respect to those States which have deposited their respective instruments of ratification, acceptance or accession on or before that date. It shall enter into force with respect to any other State three months after the deposit of its instrument of ratification, acceptance or accession. with regard to the provisions of this Convention, the implementation of which comes under the legal jurisdiction of individual constituent States, countries, provinces or cantons that are not obliged by the constitutional system of the federation to take legislative measures, the federal government shall inform the competent authorities of such States, countries, provinces or cantons of the said provisions, with its recommendation for their adoption. Each State Party to this Convention may denounce the Convention. The denunciation shall be notified by an instrument in writing, deposited with the Director-General of the United Nations Educational, Scientific and Cultural Organization. The denunciation shall take effect twelve months after the receipt of the instrument of denunciation. It shall not affect the financial obligations of the denouncing State until the date on which the withdrawal takes effect. The Director-General of the United Nations Educational, Scientific and Cultural Organization shall inform the States members of the Organization, the States not members of the Organization which are referred to in Article 32, as well as the United Nations, of the deposit of all the instruments of ratification, acceptance, or accession provided for in Articles 31 and 32, and of the denunciations provided for in Article 35. This Convention may be revised by the General Conference of the United Nations Educational, Scientific and Cultural Organization. Any such revision shall, however, bind only the States which shall become Parties to the revising convention. If the General Conference should adopt a new convention revising this Convention in whole or in part, then, unless the new convention otherwise provides, this Convention shall cease to be open to ratification, acceptance or accession, as from the date on which the new revising convention enters into force. In conformity with Article 102 of the Charter of the United Nations, this Convention shall be registered with the Secretariat of the United Nations at the request of the Director-General of the United Nations Educational, Scientific and Cultural Organization. Done in Paris, this twenty-third day of November 1972, in two authentic copies bearing the signature of the President of the seventeenth session of the General Conference and of the Director-General of the United Nations Educational, Scientific and Cultural Organization, which shall be deposited in the archives of the United Nations Educational, Scientific and Cultural Organization, and certified true copies of which shall be delivered to all the States referred to in Articles 31 and 32 as well as to the United Nations. The General Conference of UNESCO adopted on 16 November 1972 the Recommendation concerning the Protection at National Level, of the Cultural and Natural Heritage.